Nature Nirvana, a traditional plantation bungalow, in the natural surroundings of Chikmaglur beckons with fun filled activities. 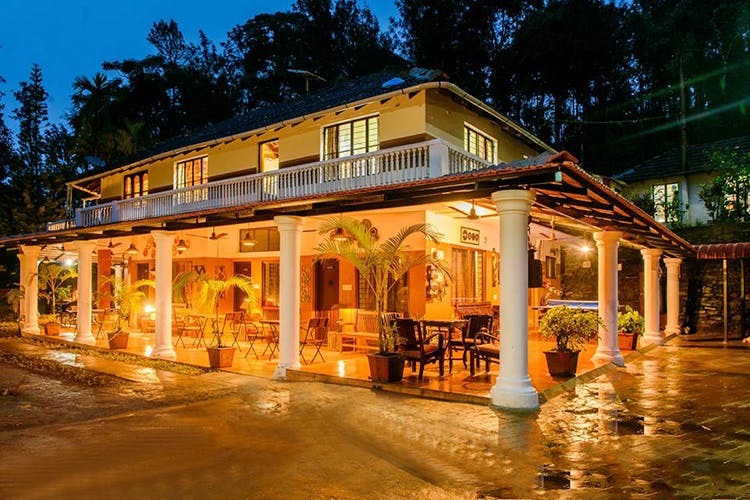 Set against the mountains of Chikmagalur, Natura Nirvana is very much just that — a palatial and tastefully done up bungalow in the midst of tropical splendour. The bungalow has spacious corridors, with traditional pillars and Indian decor. The living room has an inviting fireplace, perfect for late night gatherings with drinks and music. The rooms offered are on a twin sharing basis and can accommodate more if required. The room packages include all home cooked meals, with complimentary barbecue and campfires that can be arranged on request. The ambience is perfect to spend time indoors, but with plenty of activities that await, you will be tempted to step out and explore. Whether you picture yourself lazing under the sun set to the music of a gentle gurgling stream, or hiking up a hill — you can do all this and more at Nature Nirvana. You would need to make ample time to visit the private waterfalls, and enjoy a picnic there too. There is even a private lake where you can take boat rides at your leisure. Wake up with the sun and go bird watching as the team arrange tours, around their plantation with the option of walking or cycling. For those who want to break a sweat, you can trek to the nearest village which takes around three hours, or trek upto a fort in ruins to satiate the history buff in you. If you would like to venture into the surrounding forest, you can trek through the game sanctuary which takes upto 4 hours to explore. There are good chances you might bump into wildlife, and rare birds have been spotted here in the past too. For a little more added exploration, you can hire vehicles to take you nearby caves and mountain peaks which includes pretty trails past temples, waterfalls and jungles.